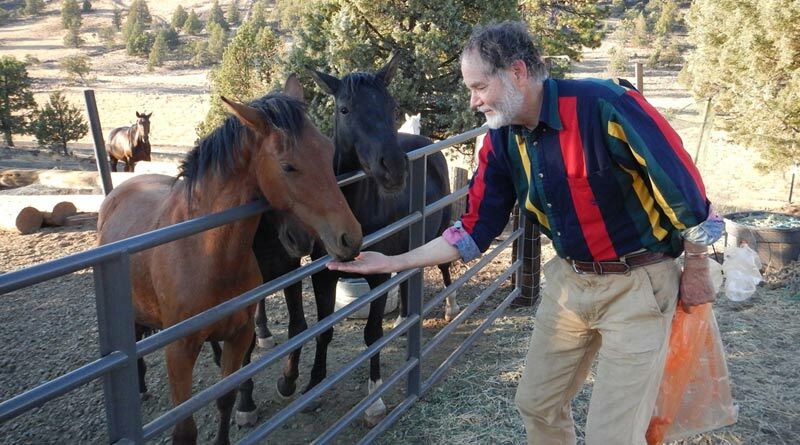 The amazing vistas and unique population of 52 wild horses at the Wildhorse Ranch made a lasting impression on wildlife ecologist Craig Downer, a well-known wildlife ecologist, wild horse expert and the author of the five-star-rated book, The Wild Horse Conspiracy. Downer’s Reserve Design Proposal is in my opinion the only way wild horses and burros should be managed on public lands by the BLM or any other entity, and it encompasses both solid science and practical experience. Of course I shared my vision for the Wild Horse Fire Brigade (WHFB) plan to save the horses already rounded-up and in corrals from slaughter or euthanasia by the BLM. And having seen first-hand the value that wild horses and burros can provide to the ecosystems in an around forests and their affect on abating ground fuels, Downer endorses the WHFB plan and encourages its adoption. The BLM is just one arm of the “powers” behind what certainly seems like the managed extermination of America’s legendary and treasured wild horses, among other things. In addition to the cattle industry, which monetarily is puny by comparison, the oil, gas and mineral conglomerates are arguably lobbying behind the scenes to remove wild horses and burros from the public lands, and with good reason from a monetary perspective; trillions of dollars. The situation is not as simple as most advocates seem to believe. I have penetrated deeply into political circles and have interviewed some key strategists and lobbyists and have subsequently connected the dots … which to me, paints an ugly picture of greed, corruption and ignorance. The “powers” are very concerned about the recent scientific revelations as to the natives species status of American wild horses, which are now starting to come into public purview. Part of that effort involved the submission of my recent article on The Three Greatest Myths About America’s Wild Horses. The powers worry that if the wild horses achieve ‘native species’ status, then, due to their relatively low numbers under ESA guidance, they could potentially become an ESA listed species. And if that happens, it throws a huge monkey-wrench into their plans for extracting trillions of dollars worth of oil, gas and minerals from the lands (habitat of a native species?) where horses and burros are currently or could be managed. Therefore, they have quietly cooperated with the policies to manage all wild horses into extinction under the boot of the BLM, as has been cited by Dr Ross MacPhee. As a part of this now exposed conspiracy, the BLM has been caught openly lying and misinforming the American public about wild horses on their website, and they were lambasted by one of the curators at the American Museum of Natural History for doing so. Here is the transcript of that diplomatic lashing of the BLM. The wild horse advocacy in general is not fully informed nor in some cases, capable of understanding the ramifications of all of the foregoing. Even getting one’s head around the money involved (trillions of dollars) requires comprehending the abstract; a financial reality so large that in the past our government was quite willing to send our military to war in regards to sums this large. So in terms of the wild horses, we see that to them by comparison, killing all the horses is like swatting a fly to us. Obstinately standing in their way, as some advocates continue to do, is just not going to work; the powers view the 1971 Wild Burro and Horse Protection Act as an inconvenience and something to be hollowed-out and then tossed into the round file. So expecting them to adhere to the Law, well, when has that happened in Washington lately? Demanding and insisting that wild horses be left in place, or returned from corrals into the Herd Areas, is just folly and will lead to their deaths, one way or another. It’s akin to standing in front of a speeding freight train expecting it to stop because there is a horse on the tracks … it won’t and they don’t. In order to save the horses, we must offer an acceptable alternative path for the redisposition of the corralled wild horses, while concurrently pursuing the legalization and codification of their American native species status. The Natural Wildfire Abatement And Forest Protection Plan (aka: Wild Horse Fire Brigade) that I have tendered has buy-in by several senior politicians, and scores of others. And it can work to save the wild horses before they are gone … the stubborn hardheadedness of some advocates will not by any means overcome or get between the powers and the money they have in their sights … and it’s just reckless to fail to learn that truth from history, which always repeats itself. The corralled horses desperately need an out of the box solution for their very survival, and this plan offers a politically and monetarily viable solution. Short of a solution that offers an acceptable alternative to the powers and the BLM, the corralled wild horses, if not sent to slaughter, will simply be shot in the head and then pushed into a huge hole in the ground using bulldozers paid for by us, which is not slaughter, and they will admit as much. Instead, it will be called ‘euthanasia’, a humane disposal of the excess horses (‘excess animals pursuant to S-3068, Section 110) by the BLM. If people really think that posting pictures and pleas all day-long on Twitter will change the course of events I have outlined above, it will be a very sad day indeed for all, and horses will be gone. That is the tragic and ugly reality. But with everyone’s help and a better strategy we can save the wild horses … that is a fact! And we accomplish that by putting them beyond the reach of those who would harm them, deep into selected and remote wilderness areas where they had survived previously for millennia. A wilderness where they can hide, just like our local herd has done; hiding-out for over a hundred years in the wilderness within the narrow canyons and forests that are beyond the reach of even helicopters. Horses are very well suited to habitat areas in and around forests, something the scientists are just now beginning to learn, which we learned 4-years ago when Laura and I entered into our mountain wilderness. Cosmos Magazine recently featured an article about how horses survived the Ice Age in Europe by moving into the forests there. Catastrophic wildfires are another area where the vast majority of public (and environmentalist NGOs) has inadequate knowledge to field a fully informed opinion. And so in some cases they prefer to continue with an obtuse perspective and proffering long-failed methods, which serves no logical purpose other than preserving ego, and donation dollars. Wildlife resources have been mismanaged in many instances as a result of over-bearing influences of naive environmentalists, who arguably do not have the extensive practical experience needed to have a complete understanding (books, field trips and videos only get you so far). They were completely wrong about the spotted owl (at a devastating cost) and their own published and documented projections on deforestation due to continued logging in 1990 were incredibly incorrect. The stark reality of the foregoing folly and lack of vision is now upon us. As we have all seen, since the transition to the ‘green movement’s’ methods of managing public forests in the 1990s, we are in fact actually losing many millions of acres of forest annually to catastrophic wildfire! Think about it … this year so far we have seen catastrophic wildfire devastate over 10 million acres in America, and of that, about 5 million acres were forests! NOW, having run the show their way for the past 30 years, we are burning forests at a rate that exceeds 40-times the rate of past logging! So, whose really destroying forests, wildlife, habitat and watersheds? Environmentalist NGOs or loggers? The spotted owl, it turns out, was being predated by the barred owl, according to the newest research. Balanced management requires logic and experience, not emotion, not ideologies, not ego. We have lions predating our local herd of wild horses so intensively now, the herd population has dropped from about 67 adults to about 52 adults in the past four years (I have the photos to prove what I say). Naturally, this is a concern to us, given the big drop in our herd. We live with wild horses and have done so in a natural forested mountain wilderness ecosystem for the past four years. Craig Downer has stayed with us at Wildhorse Ranch and knows this to be true. The now debunked wild horse and burro dogma remains thick nevertheless, and if we truly care about the horses and burros, we have to credibly deal with that as well, almost daily. How can any agency possibly expect to manage any natural resource, let alone the complexities of wild horses, without having a complete and factual understanding of the fundamental behavioral ecology of wild horses (not domestic horses). Allowing people, scientists or not, without extensive experience, to influence the management of our wild horses and burros, as well as our other publicly owned natural resources, is just pure folly. And now, we are paying the heavy price via catastrophic wildfires and the related disasters to wildlife and watersheds. When will we learn? How many people must die? How many millions of unique and special animals in the wildlands must be charred? How many homes must be lost? Will America be deforested before we wise-up? How many millions of acres of natural resources must be devastated? These are the hard questions that must be immediately faced and must take precedence in guiding management policy over and above flawed ideologies, emotion, myth and outdated dogma that have resulted in the massive management failures we are saddled with today. Yes, the wild horses would be the perfect catastrophic wildfire preventers in so many areas, saving vast forests, and areas where brush and/or grass prevail over trees as well! Now let’s just do it. Who among our senators and representatives will help us draft a bill? Hope 2018 turns into a year where we all make some good progress on this and all related issues! Craig…so good to run into this article….thank you for all your efforts for the wildones…..yes let’s never stop hoping…..thank you Bill Simpson for the article…may 2018 bring good things for the wild horses……may the force be with us…..
Another question this article brings up is the “folly” thinking of those who believe repatriation back where the horses came. I disagree with this because it would not be any different than putting them all in forested areas. Where they came includes the type of weather and forage particular hereds naturalized in, and no one that I know has just said just turn them loose. Repatriation like repatriating Christian the Lion, Elephants raised in human care or injured birds does take careful thought and planning. Careful thought and planning is not Folly. I am so upset of late of hearing those who all want the horses to stay wild and have compassionate management turn on each other, like so and so just wants money, or so and so only twits, So what. All love the horses, we all want them to stay wild, we all have different but yet similar ideas. To disgrace one advocate sends thousands away. Stick with educating with your wonderful way you do. I agree – the horses cannot just “go back where they were” – of course they should have been allowed to remain wild. But that ship has sailed. Unless and until the various advocate organizations can finally stop disagreeing – the horses are going to be left in limbo. And yeah, CAREFUL thought & planning needs to be done. This constant bickering and turning on each other quite frankly has put the horses & burros in this mess. To use contraceptives or not to use contraceptives is NOT the main issue! The main issue is the wild horses & burros LIVES! While all these advocates & organizations are involved in bad-mouthing each other – this is NOT saving lives! This is wasting time that the various lobbyists, politicians & the BLM is spending putting together a plan to kill wild horses & burros! By the time the light dawns – it will be too late & OUR wild horses & burros will be gone – permanently!